As election season draws near, hopeful politicians will be out and about sharing with the public their hopes and dreams for the next few years. One hopeful in the Chicagoland area is Robert Dold. Dold, who is running for the 10th Congressional District in Illinois, decided that his campaign needed a bit more power to get his message out. He looked to Amplivox for his solution. 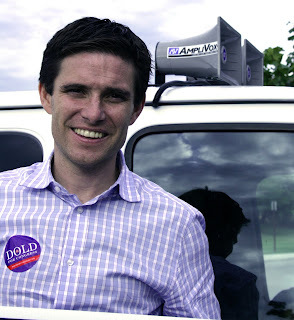 Dold and his crew decided to mount an Amplivox Sound Cruiser to one of their touring vans to help spread the message of the campaign. 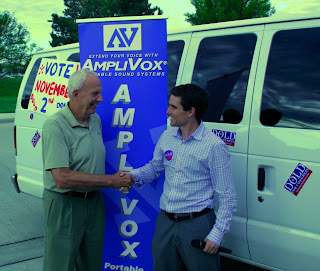 One of Dold's spokesmen Philippe Melin came by the Amplivox office in Northbrook, IL to show off the Sound Cruiser and how it has helped their campaign. The Amplivox Sound Cruiser can be a major addition to any political campaign or event where your message needs to hit the road. The Cruiser is a portable PA system that includes two horns that can be attached anywhere. It offers clear and quality sound with plenty of power to make sure your message is heard clearly. 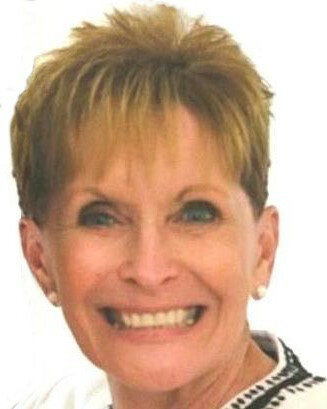 Check out the spec sheet and customer testimonies. Click the 'Sound Cruiser' tab on the right side of the page to see the testimony. Amplivox is proud to help out the community in any way possible including Going Green and our Pink Podium Promise. We look forward to finding more ways we can reach out and give back to the communities we love. If you have any questions or would like to look at more of our products, visit us at Ampli.com. Check out our new video on Dold's visit!